Was horn in Caithness, Scotland, April 5, 1829. In 1852 he came to Canada on a sailing vessel which took six weeks to cross the Atlantic In 1854 he took up land in Elderslie Township. In 1857 he returned to Scotland and married Isabella Jack. They came to the farm where they remained until 1913. He was the first citizen of Paisley to pass the century mark. At the age of 103 he died in Paisley, September 8, 1932. None of his family of three sons and four daughters survives. Two grandchildren are Mrs. John Pace of Paisley, and Mrs. Campbell Ewen of Chesley. Was born in Bruce Township. In 1908 he married Margaret Lewis of Elderslie Township, and they farmed on the 2nd concession of Bruce until coming to Paisley 55 years ago. Mrs. Wrightson passed away in 1963. Wm. 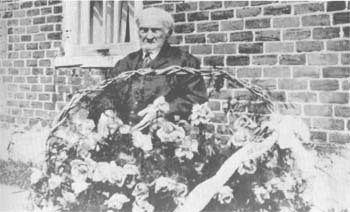 Wrightson was a master carpenter, and a well-known builder of barns, many of which are still standing throughout the County. For the last four years of his life he resided in Kitchener where his two sons Lewis and Harvey reside. He passed away in April 1973. Mr. McArthur came to Paisley as an infant. After attending school here, he entered the carriage making trade in Paisley with his father, the late ].B. McArthur. With the advent of the automobile, he became one of Paisley’s earliest car dealers as agent for McLaughlin-Buick, which agency he retained until he retired in 1935. 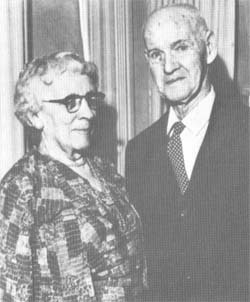 Mr. McArthur continued to reside in Paisley with his wife, the former Christina McLean until 1963 when they went to live at Bruce Lea Haven in Walkerton. Although she was not quite 100 years old at her death, she is included in this article since it is unlikely that any couple had as many years together as she and her husband. Mrs. McArthur (Christina McLean) was born in Saugeen Township just north of Paisley. She married John McArthur in 1900. They resided in Paisley for almost 90 years. She was active in the work of Westminster Presbyterian Church, and was an ardent horticulturalist. She passed away in May 1973 in her 100th year. Grant, Ross and Duncan are their three sons who survive.